TOPP I NYDELIG DYP BLÅ FARGE MED KOMODOS DIAMANTFORMEDE "HAVFRUESTRIKK" I EN SJØGRØNN TRÅD, UTROLIG FIN KOMBINASJON. TOPPEN ER I 100 % ØKOLOGISK LIN. DEN ØKOLOGISKE LINEN ER LETT OG DEN BÅDE VARMER OG FØLES SVALENDE MOT HUDEN. TOPPEN ER PERFEKT FOR VÅR OG SOMMER. Mermaid sightings this 19' in our CATHY top. This is part of our "Mermaid Knit" collection. 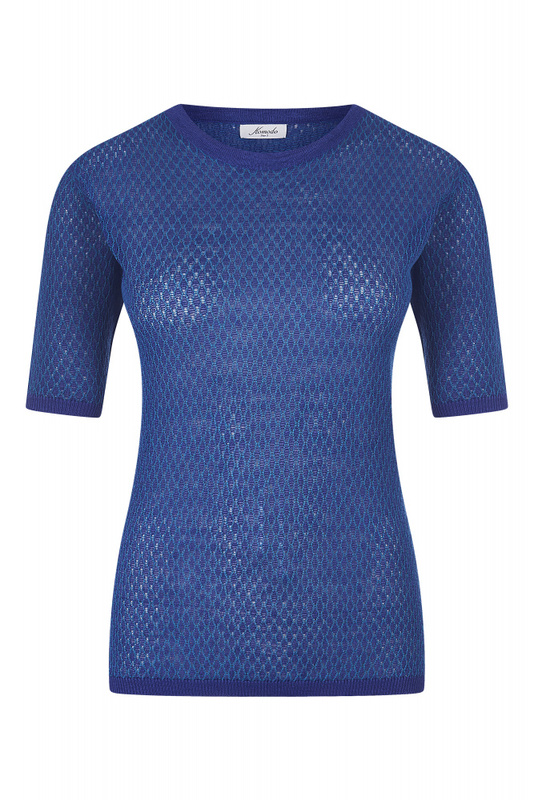 This slim-fitting diamond shaped pattern with a round crew neckline is cut just above the elbow. Features a contrast trimming for a clean finish. Wear your CATHY top with a midi skirt, floppy summer hat and you're ready to take on your mermaid responsibilities!